This article is about the breathing gas. For the cryogenic system, see Heliox (cryogenic equipment). Heliox is a breathing gas composed of a mixture of helium (He) and oxygen (O2). Heliox is a medical treatment for patients with difficulty breathing. The mixture generates less resistance than atmospheric air when passing through the airways of the lungs, and thus requires less effort by a patient to breathe in and out of the lungs. Heliox has been used medically since the 1930s, and although the medical community adopted it initially to alleviate symptoms of upper airway obstruction, its range of medical uses has since expanded greatly, mostly because of the low density of the gas. Heliox is also used in saturation diving and sometimes during the deep phase of technical dives. In medicine heliox may refer to a mixture of 21% O2 (the same as air) and 79% He, although other combinations are available (70/30 and 60/40). reduced resistance in turbulent flow. Heliox has a similar viscosity to air but a significantly lower density (0.5 g/l versus 1.25 g/l at STP). Flow of gas through the airway comprises laminar flow, transitional flow and turbulent flow. The tendency for each type of flow is described by the Reynolds number. Heliox's low density produces a lower Reynolds number and hence higher probability of laminar flow for any given airway. Laminar flow tends to generate less resistance than turbulent flow. In the small airways where flow is laminar, resistance is proportional to gas viscosity and is not related to density and so heliox has little effect. The Hagen–Poiseuille equation describes laminar resistance. In the large airways where flow is turbulent, resistance is proportional to density, so heliox has a significant effect. Heliox has been used medically since the early 1930s. It was the mainstay of treatment in acute asthma before the advent of bronchodilators. Currently, heliox is mainly used in conditions of large airway narrowing (upper airway obstruction from tumors or foreign bodies and vocal cord dysfunction). There is also some use of heliox in conditions of the medium airways (croup, asthma and chronic obstructive pulmonary disease). Patients with these conditions may suffer a range of symptoms including dyspnea (breathlessness), hypoxemia (below-normal oxygen content in the arterial blood) and eventually a weakening of the respiratory muscles due to exhaustion, which can lead to respiratory failure and require intubation and mechanical ventilation. Heliox may reduce all these effects, making it easier for the patient to breathe. Heliox has also found utility in the weaning of patients off mechanical ventilation, and in the nebulization of inhalable drugs, particularly for the elderly. Research has also indicated advantages in using helium–oxygen mixtures in delivery of anaesthesia. Owing to the expense of helium, heliox is most likely to be used in deep commercial diving. It is also sometimes used by diving enthusiasts, particularly those using rebreathers, which conserve the breathing gas at depth much better than open circuit scuba. The proportion of oxygen in a diving mix depends on the maximum depth of the dive plan, but it is often hypoxic and typically 10%. Each mix is bespoke and is created using gas blending techniques, which often involve the use of booster pumps to achieve typical diving cylinder pressures of 200 bar (2,900 psi) from lower pressure banks of oxygen and helium cylinders. Because sound travels faster in heliox than in air, voice formants are raised, making divers' speech very high-pitched and hard to understand to people not used to it. Surface personnel often employ a piece of communications equipment called a "helium de-scrambler," which electronically lowers the pitch of the diver's voice as it is relayed through the communications gear, making it easier to understand. Trimix is a slightly less expensive alternative to heliox for deep diving. 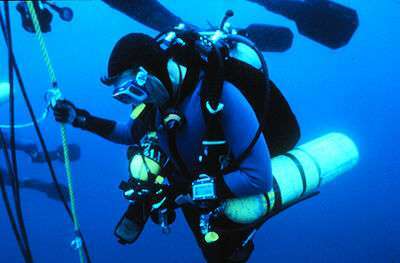 Trimix is often used in commercial diving and in technical diving. In 2015, the United States Navy Experimental Diving Unit showed that bounce dives using trimix are not a more efficient decompression than dives on heliox. ↑ Barach AL, Eckman M (January 1936). "The effects of inhalation of helium mixed with oxygen on the mechanics of respiration". Journal of clinical investigation. 15 (1): 47–61. doi:10.1172/JCI100758. PMC 424760 . PMID 16694380. ↑ "Heliox product information". BOC Medical. Archived from the original on 21 November 2008. ↑ US Navy Diving Manual, 6th revision. United States: US Naval Sea Systems Command. 2008. Retrieved 2008-07-08. ↑ Brubakk, A. O.; T. S. Neuman (2003). Bennett and Elliott's physiology and medicine of diving, 5th Rev ed. United States: Saunders Ltd. p. 800. ISBN 0-7020-2571-2. ↑ "Heliox21". Linde Gas Therapeutics. 27 January 2009. Retrieved 13 April 2011. ↑ BOC Medical. "Heliox data sheet" (PDF). ↑ Lee DL, Hsu CW, Lee H, Chang HW, Huang YC (September 2005). "Beneficial effects of albuterol therapy driven by heliox versus by oxygen in severe asthma exacerbation". Acad Emerg Med. 12 (9): 820–7. doi:10.1197/j.aem.2005.04.020. PMID 16141015. Retrieved 2008-07-08. ↑ Buczkowski PW, Fombon FN, Russell WC, Thompson JP (November 2005). "Effects of helium on high frequency jet ventilation in model of airway stenosis". Br J Anaesth. 95 (5): 701–5. doi:10.1093/bja/aei229. PMID 16143576. Retrieved 2008-07-08. ↑ "Example pricing for filling cylinders". Retrieved 2008-01-10. ↑ Ackerman MJ, Maitland G (December 1975). "Calculation of the relative speed of sound in a gas mixture". Undersea Biomed Res. 2 (4): 305–10. PMID 1226588. Retrieved 2008-07-08. ↑ Stone, WC (1992). "The case for heliox: a matter of narcosis and economics.". AquaCorps. 3 (1): 11–16. ↑ Doolette DJ, Gault KA, Gerth WA (2015). "Decompression from He-N2-O2 (trimix) bounce dives is not more efficient than from He-O2 (heliox) bounce dives.". US Navy Experimental Diving Unit Technical Report 15-4. Retrieved 2015-12-30.